Ontario North.ca - 211North.ca - 211 Ontario North � Home . . Canada. Attached an urgent letter we just receivedfrom the Customs Controlling Department United States for the immediate release ofCompensation funds of $5.5 Million Dollars to 22 beneficiaries. According to the letter/instruction your name is among the list of beneficiaries to be compensated. We need the above listed information in order to reconfirm with your details we have here and cross check if they correspond in order for us not to make any mistakedelivering to the wrong beneficiary. 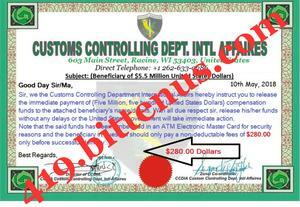 Awaiting your details together with the requested fees of $280 dollars as seen in your letter from the Customs before we commence your ATM Master Card Delivery.